This website, https://shopatmarketstreet.com/, is owned and/or operated by Trademark Property Company. Information You Manually Provide. Market Street – The Woodlands collects the information you manually provide (using your keyboard, mouse, or touchpad) when you use this Site. For example, we collect the information you submit when you register with this Site, participate in a contest, sign up for our newsletters, comment on a news item, or contact us with questions. Some of the information you manually provide may be Personal Information, such as your name and contact information. In addition to the cookies Market Street – The Woodlands delivers to your computer through this Site, certain third parties may deliver cookies to your computer for a variety of reasons. For example, we use Google Analytics, a web analytics tool that helps us understand how visitors engage with this Site. To learn more about Google Analytics, click here. You have choices about the collection of information by third parties on this Site. For example, if you don’t want information about your visit to this Site sent to Google Analytics, you may download an Opt-out Browser Add-on by clicking here. Please note that the Add-on does not prevent information from being sent to Market Street – The Woodlands. In addition, if you would like to opt-out of having interest-based information collected during your visits to this or other sites, please click here. You will be directed to an industry-developed Web site that contains mechanisms for choosing whether each participating entity may collect and use data for online behavioral advertising purposes. It may be that some of the third parties that collect interest-based information on this Site do not participate in the industry-developed opt-out website, in which case the best way to avoid third-party tracking of your online behaviors may be through your browser settings and deletion of cookies. Placewise Digital. Mallfinder Network LLC d/b/a Placewise Digital powers this Site and manages the information we collect through this Site. As such, Placewise Digital helps us with our promotional efforts and conducts surveys related both to this Site and your shopping experiences at Market Street – The Woodlands, among other activities. In addition, we allow Placewise Digital to use your information for its own marketing purposes. In particular, Placewise Digital operates the Shoptopia Network, which is a network of various shopping centers for which Placewise Digital powers Web sites. Placewise Digital may use the information you submit on or through this Site to contact you about other malls that we own. Placewise Digital may also send you e-mails about Shoptopia.com. Please note that by registering on this Site, you are also registering with Shoptopia and will be able to use the same username and password to access the services provided through that network. Other Third-Party Vendors. We may share information collected through this Site with other third-party vendors who act for or on behalf of Market Street – The Woodlands. These third-party vendors may need information about you to perform their functions. However, they are bound by law or contract to protect your Personal Information and, unlike Placewise Digital, are only allowed to use the Personal Information to perform services on our behalf. 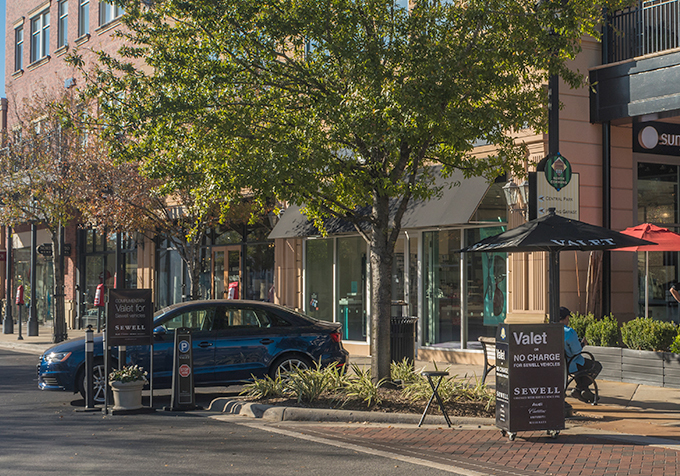 This Policy describes Market Street – The Woodlands’s current policies and practices with regard to the information we collect through this Site. The terms “Market Street – The Woodlands,” “we,” “us,” and “our” refer to Trademark Property Company. References to this “Site” refer to the Web site owned by Market Street – The Woodlands and located at https://shopatmarketstreet.com/.